Included in the Collaborator Sponsorship are 8 tickets to the Women of Excellence Awards Program! Included in the Influencer Sponsorship are 4 tickets for the Women of Excellence Awards Program. 1 Women of Excellence Ticket is included in your Partner $500 Sponsorship. 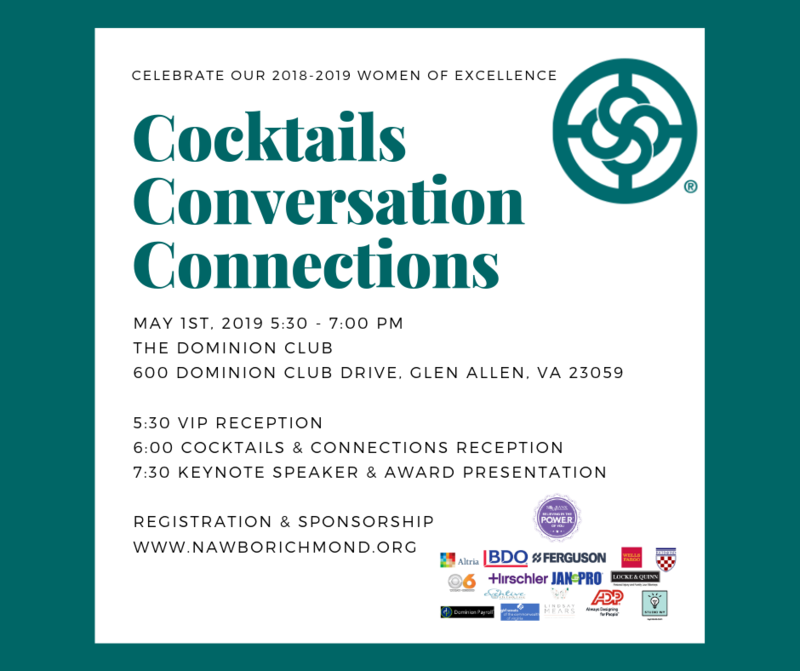 All NAWBO Richmond members receive a discounted member rate for the Women of Excellence Awards Program. We encourage the entire Central Virginia business community to attend the Women of Excellence Awards Program! Discount tickets are available for NAWBO Richmond members only. This year we are offering a new opportunity as part of our new venue, new vibe. This includes an opportunity for you to highlight your products and services and interact with our estimated 275 attendees! Join Sona Bank P.O.W.E.R. for our VIP Reception, where you will make POWERFUL connections! This Visionary Sponsorship includes 12 tickets to the Women of Excellence Awards Program. This sponsorship allows you 5 tickets, half (1/2) of a table of ten for our Women of Excellence Awards Program! With this package, your half table will receive VIP status and be invited to attend the VIP Reception and to enjoy a night cap after the awards presentation! Make sure to join Sona Bank P.O.W.E.R. for our VIP Reception, where you will make POWERFUL connections! We thank the Dominion Club for hosting the 2019 Women of Excellence Awards Program! This sponsorship includes a full table of 10 for the Women of Excellence Awards Program. With this package, your full table will receive VIP status and be invited to attend the VIP Reception and to enjoy a night cap after the awards presentation! Make sure to join Sona Bank P.O.W.E.R. for our VIP Reception, where you will make POWERFUL connections! Make sure to join Sona Bank P.O.W.E.R. for our VIP Reception, where you will make POWERFUL connections!